ESP Auto Inc., Services: Batteries | ESP Auto Inc.
At ESP Auto Inc. we use only the highest quality replacement batteries. This means we rely on Interstate Batteries – for your vehicles and also for our own! And how do we chose our batteries? Great question! It is so important to select the right battery for your living and driving conditions. This means taking our climate and your driving preferences into account. For instance, although we all know that our New England winters can take their toll on any car’s battery, the summers can be brutal too. Extremes in temperatures can lead to a battery draining problem so that’s why it is vital to purchase the best quality products possible. Our MT series battery comes with a 24-month free/5-year performance warranty. After the first 24 months, the warranty is prorated per month up to 60 months. And for our MTP series, we are proud to offer a 30-month free /6-year performance warranty. After the first 30 months, the warranty is prorated per month up to 72 months. This is one of the best warranties in the business! 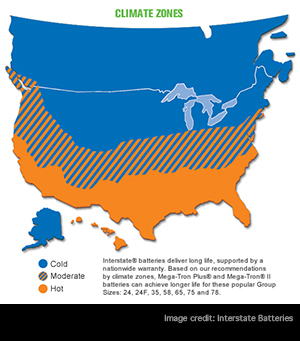 Interstate Batteries offers a helpful zipcode locator map to help you find the best battery for your area and it’s a resource we use in selecting which battery we put in your car. What else plays into our choice? We also take into account what we know of your driving habits. Do you own a GPS? Using that with the engine off can drain your battery. Are you keeping the kids entertained with a DVD in the car as you run all of your errands? This too can shorten the life of your battery. We take this and many other factors into account so that we can install the best battery in your vehicle. Contact us today if you would like to schedule an appointment for a battery replacement!